Simpsons Chubby-1 in Super. This is a great brush and the newest of the group. I've probably used it about 20 times. Awesome soft three band that is better than any Simpson's Best grade brush that I have used. Simpson's website says the CH1 is 22mm, but Maggards says 24. It seems closer to 24 to me, and the handle is very small. I'd gladly keep it, but I'd prefer a CH-2 in Super, which I might get if all three of these sell. I've seen these priced anywhere from $139 on Amazon to over $185 from online shaving vendors. My price is $90. 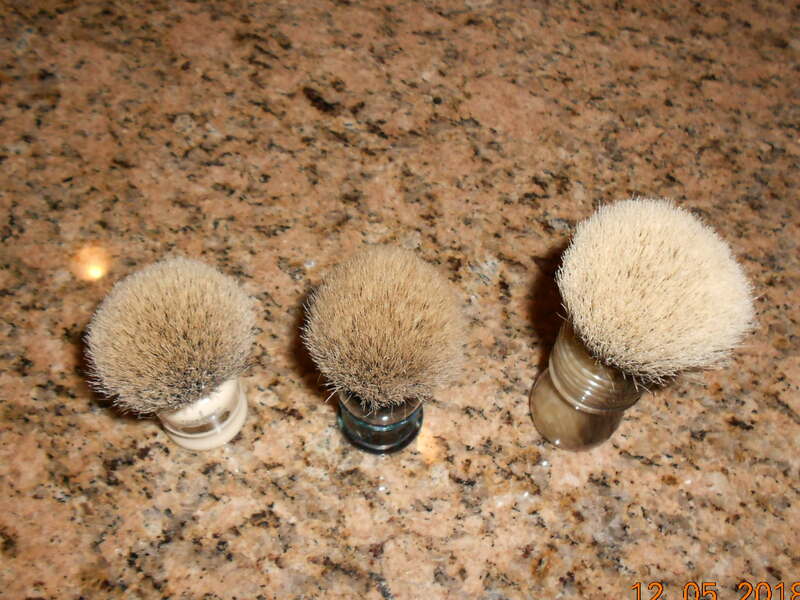 The one in the middle is a Love Your Shave handle from Vladimir Ferdman. I am the third owner and the brush is almost two years old. 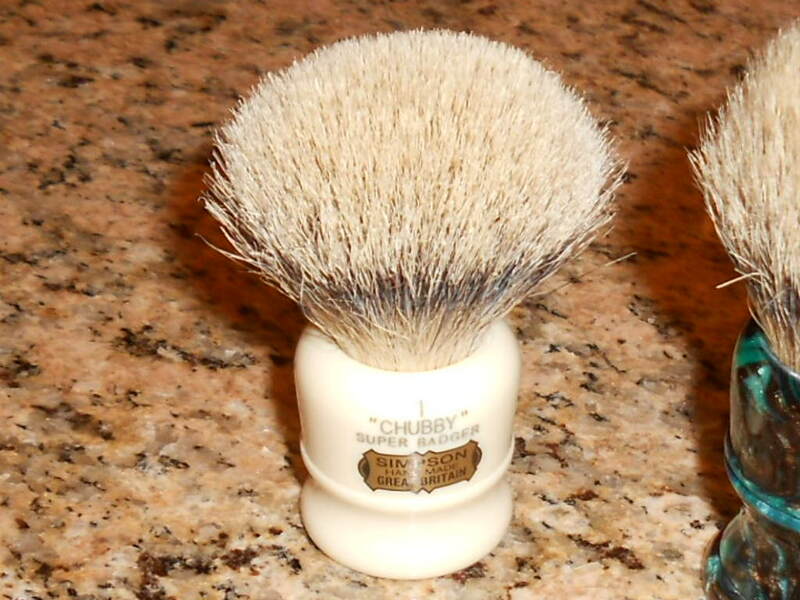 The man who sold it to me said the knot was a 28mm D01 Silvertip from Shavemac. The knot is dense and the hairs are very fine and soft. There is no scrub or scritch whatsoever. In fact, for such a dense knot it splays very easily and is even a little floppy. 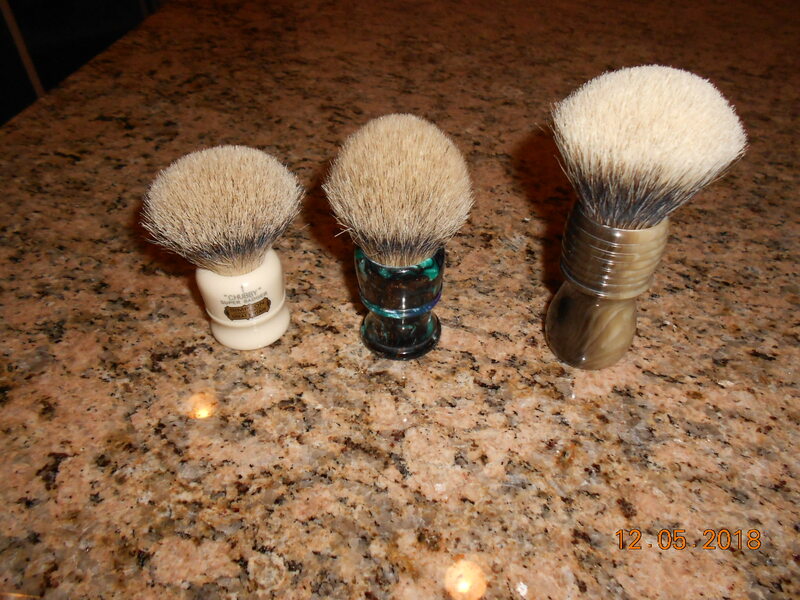 It's hard to estimate what one of these costs new because it was a custom, but a Vlad handle is usually around $65, and a 28mm D01 ST is $185 according to Shavemac's knot configurator. Even if it were a regular silvertip instead of a D01 the knot alone would cost about $128. This one loses a hair or two almost every time I use it. Because of that I'm pricing it at $50. I honestly believe that is a steal for this brush. The hair is some of the best I've ever used. The big tall one is an Elite Razor faux horn handle with an Elite Razor Manchurian White 26mm knot. The handle is pretty plain looking and doesn't have the shine of a Paladin or even a new Elite, but the knot is an Elite Machurian, one of the true legends of wet shaving. I've had this brush a while and have used it regularly in a rotation of about 15 brushes. The knot is still like new. The ONLY reason I'm willing to part with it is because I have another 26mm Elite MW in a Wolf Whiskers handle. The loft on this is about 50mm. Backbone is exceptional. The tips are soft (bordering on gelly). This would cost about $130 new from Elite. $75 from me. Elite sold. Only the Vlad Ferdman/Shavemac remains. I'll leave this up for a while, but if it doesn't sell I'm fine with keeping it in the rotation. Thanks to the buyers of the other two, and to everyone who works on and supports the Nook. Your are right about the Chubby 2. Perfect size. GLWTS! Looks like I'll be keeping the Shavemac. Thanks for looking and thanks again to the buyers of the other two.